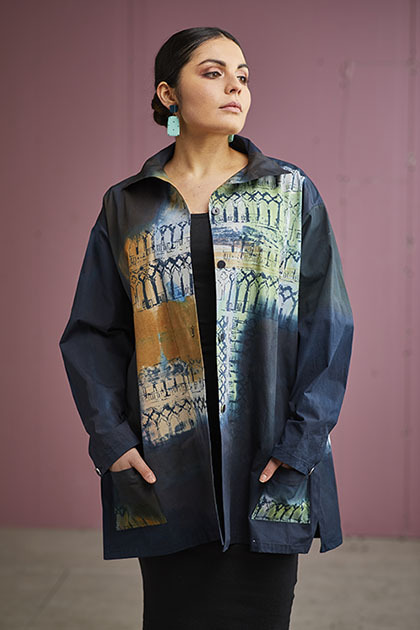 The sensory feast of the city of Venice has inspired Carole Waller’s latest collection of hand painted clothing which, like the Venice itself, is full of colour, bold reflections and fluidity of movement. “Visiting Venice once again last spring I was completely captivated and transported back to magical childhood visits, “ Carole explained. “I have taken images of archways stretching over the canals, reflections of boats and the beautiful grilles at the windows of the Peggy Guggenheim Collection. These repeating patterns create screens through which colour seeps through – the shadowy greys, silvers and sludgy greens of the canals and the bright reds and blues reflected on the water and pale whites and greys and soft pastels of the lagoon as the sun sets”. This colour palate forms the basis of the collection with surprising splashes of bright red in a nod to “Don’t Look Now”. “The colourful red awnings along the canals serve as a counterpoint to the subdued and sludgy colours of the canals and bright reflections of the buildings which change minute by minute as the light shifts” says Carole. Carole pays homage to her mother who, as a young artist alone in Italy, was equally enchanted by Venice which she painted in a series of watercolours “beautifully capturing the buildings with her sensibility to colour and atmosphere”. 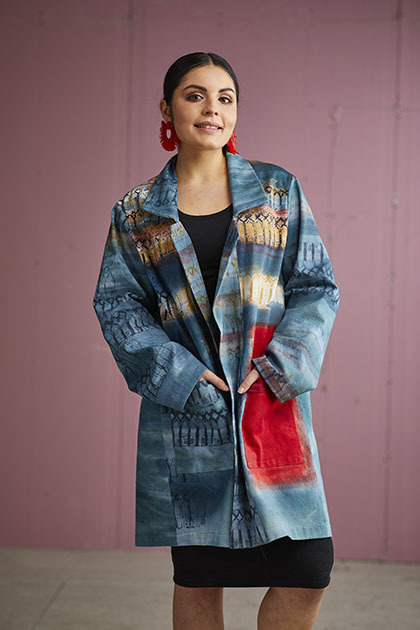 Another element that appears throughout the collection is taken from an iconic print from a drawing of the Ca D’Oro Palace on the Grand Canal. Carole went to seek out the block printers of which only a handful remain. “ I have dedicated my collection to them and their beautiful, simple renditions of the decorative and spiritual uplifting buildings of Venice. Making an investment in a piece by Carole Waller ensures that you will always be the centre of attention. They are indeed unique, whether you are drawn to a tie wasted shirt or a neat dress or a flowing scarf that in itself will be a talking point. And for special occasions, Carole is always happy to create a one-off, bespoke outfit; please contact Carole Waller for a one-to-one appointment: 07803033629.